Paul Barth ’17 discusses his journey as a transfer student in the College of Geosciences. Every Aggie has their own journey. Many grow up knowing about Aggieland from the time they are born, while others grow to know about it in time. Some travel more unconventional paths to get here. Paul Barth ’17 of Las Vegas, Nevada did not take the common path to becoming an Aggie. But in May of 2017, he walked away with his degree, Aggie Ring, and a job with one of the largest companies in the world. 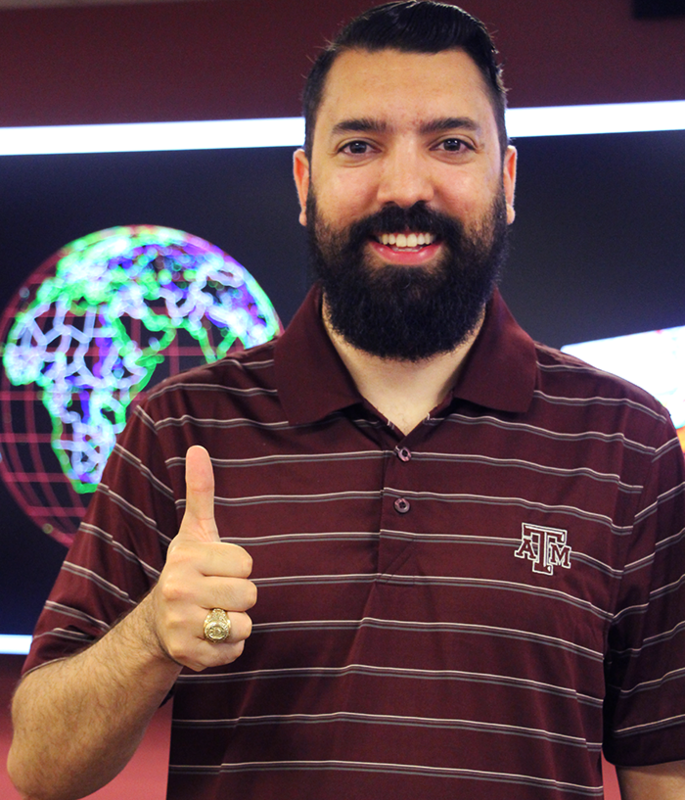 Prior to landing in Aggieland, Paul spent 4 years in the United States Air Force as a geospatial intelligence analyst – and that is where his journey to Texas A&M began. Paul knew he wanted to work in the oil & gas industry, and that played a major role in drawing him to Texas A&M. “The GIS program (at Texas A&M) looked great – and it’s close to Houston, where oil & gas is centered. I knew that would be a great opportunity for me,” he said. Having a family also meant Paul needed to support them, in addition to keeping up with his degree program. “One thing that really helped me, since I had to work to support my family, was getting a job on campus working for a professor in the Chevron Basin Modeling Center with the College of Geosciences Berg-Hughes Center – doing something related to my degree. That helped solidify the things I learned in class, and better develop my skills. That was definitely a blessing for me,” Paul said. Having a busy schedule with work, class, and family did not stop Paul from making the most of his opportunities. He attended Texas A&M’s GIS Day, and acquired an internship with ConocoPhillips in the summer of 2015. He worked as a GIS analyst embedded on land teams – dealing with leases, property rights, drilling rights, and permits. “I loved it,” he added. Paul was able to take that experience and secure a full-time position with Chevron in Houston, where he will work as a geospatial analyst. But it was not just the classes and internship experience that helped Paul get to this point. Networking with other people in his field was crucial for Paul. In his time in the College of Geosciences at Texas A&M, Paul discovered what it took to set himself apart from his peers – and he embraced it. "Paul is definitely one of the success stories of our GIS program. He took every opportunity that Texas A&M offered and ran with them. His hard work in and out of the classroom really paid off. He is an excellent role model for current and future students to follow. We know he will have a successful career, and we look forward to him mentoring future generations of Aggies." For Paul, it’s very clear the hard work has paid off – and that he made the right choice. “Applying what you’ve learned in the classroom to real life will give you great experience for your resume,” he added.